Stores reference 22c/1046. 'Lifelines With Toggles For Waistcoats-Life Saving - 22C/447'. Thick cord lanyard approximately 2.3m in length (7'6"). Wooden toggle to one end. These are 'waterproofed'/ treated to prevent rot with what smells a bit like creosote. These form part of the equipment of the 1941 pattern Mae West. Normally found sewn into the left 'pocket' with the toggle protruding out at the bottom and held in place with a few easily broken stitches. 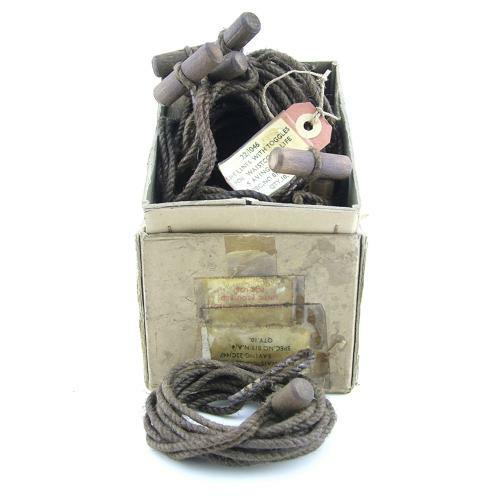 When needed, the toggle end would have been pulled out from the pocket and used to attach the 'downed' airman to a dinghy or other aircrew members. Often missing. Useful to complete a mae-west. Excellent, new old stock/unissued condition. Stock code MW14956.